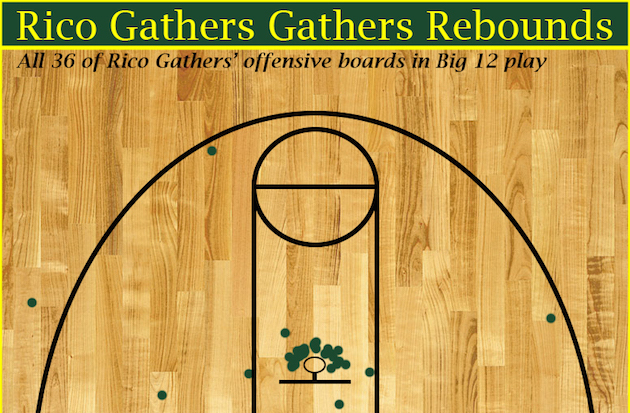 How Baylor's Rico Gathers became one of college basketball's most formidable rebounders. Henderson wasn’t the only observer awed by Gathers’ performance. The junior scored 25 points on 9-of-17 shooting and grabbed a Big 12-record 28 rebounds. Statistically speaking -- and making due allowance for the quality of opponent -- it was Gathers’ best game of the season. Accordingly, he was named co-Big 12 player of the week on Monday. Yet that game doesn’t feel like an outlier when viewed within the context of Gathers’ glass-cleaning oeuvre. Through 19 games this season, he has averaged 11.9 rebounds per game, second-most in the nation. His offensive rebounding percentage of 20.3 is also second-best in the country among players who have logged at least 40 percent of available minutes, according to KenPom.com. 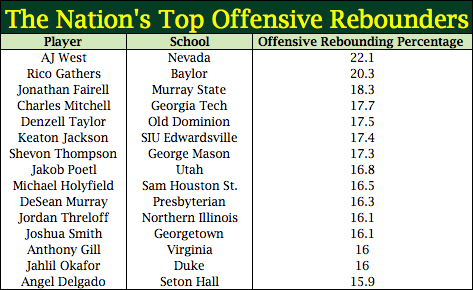 A player’s OR% takes into account his team’s offensive rebounds plus the opponent’s defensive rebounds. Gather’s ability to create second chances has helped put Baylor, which was picked to finish sixth in the Big 12’s preseason poll after losing three of its top four scorers from last season’s Sweet 16 squad, on track to notch consecutive NCAA tournament berths for the first time in program history. Entering Tuesday night’s game at Oklahoma State, the Bears are 15-4, ranked No. 20 in the AP poll and have posted a .500 record against a difficult league schedule. With Gathers leading the way, it should come as little surprise that the Bears rank as the Big 12’s top offensive rebounding team; in fact, they are first nationally with a 42 OR%, per Kenpom. Gathers combines brute force with savvy positioning, and at 6-foot-8, 275 pounds, he is so strong that even taller opponents have a hard time keeping him away off the backboards. His first focus when a shot goes up is locating the ball. He said he has a good sense for where the ball will travel after it bounds off the rim, but he has also learned to anticipate the path of the ball depending on which side the shot comes from. He actually tries not to focus too much on boxing out opponents, which he says can cause him to not get rebounds because he loses sight of the ball. Gathers’ size and strength afford him natural advantages when it comes to carving out space under the basket, but he doesn't rely on those attributes alone. He sticks out his elbows, shoulders and hips and even uses “swim moves” or spins to get into the best position. He tries not to use his hands, because, he says, that could put him in jeopardy of being called for a foul. Bears coach Scott Drew said he’s put his team through fewer rebounding drills this season for fear it could lead to players getting hurt. “It’s people bouncing off of [Gathers], trying to hit that load," Drew told SI.com. "You can get hurt trying to block him out." Drew said he typically sends between two to four players to crash the glass on a given possession, with the number varying based on personnel and the opponent. Gathers, however, is advised to hunt rebounds on every shot. “He’s always a rebounder -- he’s never a get-back guy,” Drew said. While Gathers most often attempts to grab a rebound, he will sometimes try to tip the ball in instead. On layups, Gathers said he tries to post himself near the basket to improve his chances of getting a tip-in, whereas he typically stands outside the restricted area on three-point shots before crashing the glass. According to data from the scouting service Synergy Sports Technology, the putback is Gathers’ most frequent (35.7%) type of offensive play. In addition, according to hoop-math.com, 37.8 percent of Gathers’ shots at the rim have come on putbacks, the highest percentage of any Big 12 player averaging at least 22 minutes per game. Sometimes Gathers' work under the rim leads to putbacks for teammates, because blocking him out often requires more than one player. Consider this crucial sequence in a Jan. 14 game against Iowa State. With the score tied at 70 and less than 40 seconds remaining, Baylor guard Kenny Chery drove into the lane and pulled up in front of Cyclones forward Georges Niang for a jump shot. After the ball left Chery’s hands, Gathers forced Jameel McKay and Bryce Dejean-Jones deep into the paint. With the two of Iowa State's would-be rebounders out of position, Bears forward Johnathan Motley hauled in the rebound and converted a layup. Iowa State answered with a DeJean-Jones three after a timeout, but Chery drilled a jumper to help the Bears pull out a one-point win. Still, as important as Gathers’ space-clearing maneuver against Iowa State was, perhaps the most ridiculous Gathers moment of the season came early in the second half of a win over TCU on Jan. 10. After Motley missed a hook shot, Gathers made the Horned Frogs' frontline look like a jayvee team as he muscled for two offensive rebounds before finally finishing a layup. Gathers’ physicality may lead one to wonder whether he has a future in a different sport. Before the season, Gathers said Bears football coach Art Briles approached him about lining up at tight end, and that several Baylor players -- including star quarterback Bryce Petty and defensive lineman Shawn Oakman -- talked to him about playing on the team. Gathers hasn’t played competitive football since middle school but says he considers it his “Plan B” after basketball. For now, his focus is on improving his hoops skills while helping Baylor compete, board after board, in one of the nation’s toughest conferences.